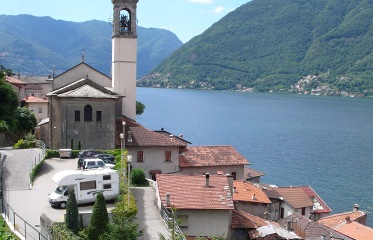 Torno is small town on the steep shores of the lake Como, just 50 km north of Milan. 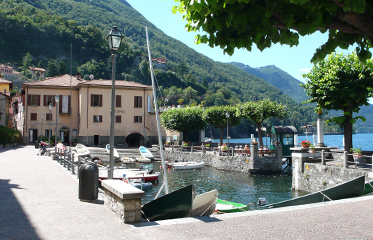 It is connected with regular public boat traffic with Como and rest of the towns along the lake. This beautiful little square around the harbour, with the church, several albergos - specific small hotels - one drinking fountain and always, even very early in the morning, with lot of tourists. Locals enjoying views to the distant mountains [Dolomites] and special atmosphere on this square. 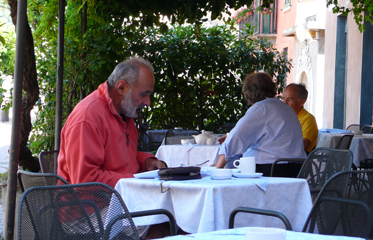 We were just having unforgettable breakfast on the patio, early in the morning after a long flight from Canada.